With our inaugural exhibition – R/evolution, Tina Keng Gallery establishes continuality from its legacy, and also the revolutionary spirit towards the future of boundless possibilities. R/evolution attempts to examine and summarize Ms. Tina Keng’s role in the art market and Chinese art history during the past 20 years. Chinese Modern Art has been the field in which Tina Keng has the most expertise, and the participating artists of this exhibition cover three generations of Chinese artists. This reflects her gallery experience of two decades, as well as the progress and evolution of the art market throughout the years. 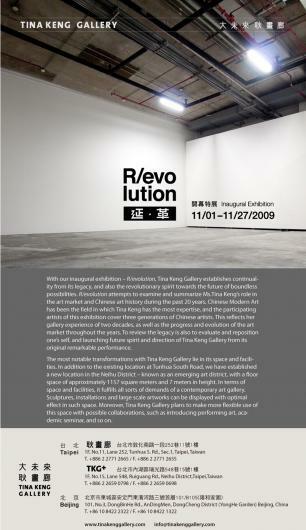 To review the legacy is also to evaluate and reposition one’s self, and launching future spirit and direction of Tina Keng Gallery from its original remarkable performance. 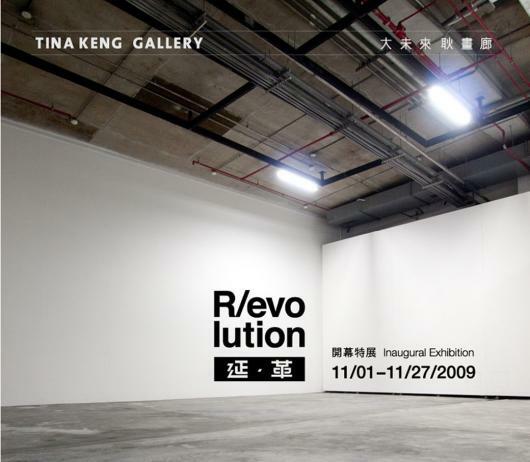 The most notable transformations with Tina Keng Gallery lie in its space and facilities. In addition to the existing location at Tunhua South Road, we have established a new location in the Neihu District – known as an emerging art district, with a floor space of approximately 1157 square meters (3,800 sq. feet) and 7 meters (23 feet) in height. In terms of space and facilities, it fulfills all sorts of demands of a contemporary art gallery. Sculptures, installations and large scale artworks can be displayed with optimal effect in such space. Moreover, Tina Keng Gallery plans to make more flexible use of this space with possible collaborations, such as introducing performing art, academic seminar, and so on.